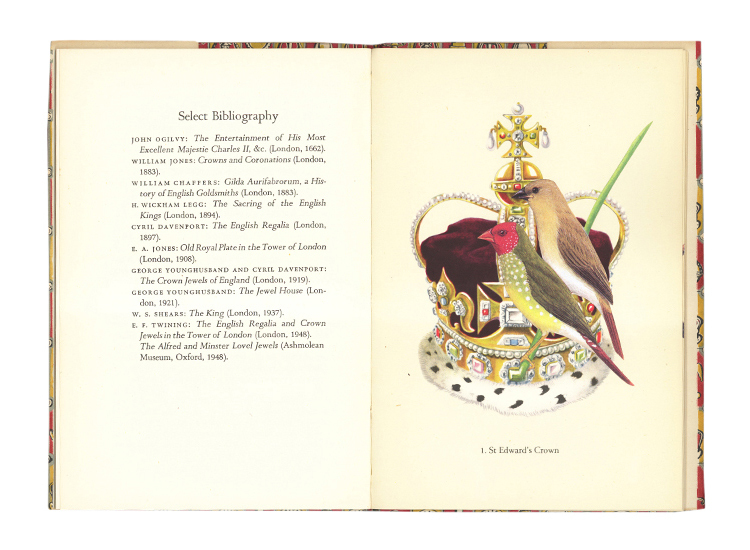 The sixtieth King Penguin, The Crown Jewels (published 1951), is now home to the solitary paca (upon the cover), a red howler atop Queen Mary’s crown and a black howler atop the Queen Consort’s crown, and an ocelot by the Orbs. It features sixteen colour plates now embellished and buffed by animal tail, and it was made especially for the exhibition By This Unwinking Night (2012). Other King Penguins to have been modified by the means of collage include One step ahead; This is where the dormouse lives; Testing the laws of hazard; and The first aerial travellers. The entire series of King Penguins thus far is in the collection of the State Library of New South Wales. In the gallery, before a wall of some 443 postcard collages, we invite you to turn the pages of A headdress to show you how much I care. Playing in the background, you can hear the delights of Roy Smeck's Ukulele Bounce, 1949.